Crisp. Silent. Still. With an energy indescribable and a beauty inexpressible. And were that not enough, it’s the happiest place on earth too. 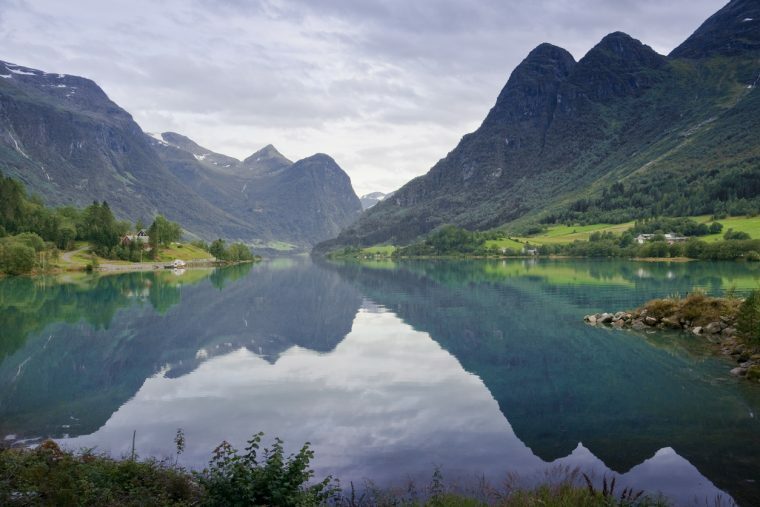 The Norwegian Fjords are the pride of Norway. The nation’s heart and soul in granite form, bathed with an ice white light in the morning and aflame with a peach glow as the sun sets. When it sets. After all, this is the land of the midnight sun and the northern lights, the ever-changing hues only adding to the atmosphere. Lapped by inky waters and held up on a pedestal almost as tall as the searing cliff faces themselves, the Norwegian Fjords are utterly beautiful. They shouldn’t be on your bucket list. Why wait? Go now. Don’t be reluctant to trade sun, sea and sand for mountains, glaciers and waterfalls. This is scenery that stirs your soul and ignites your sense of adventure. 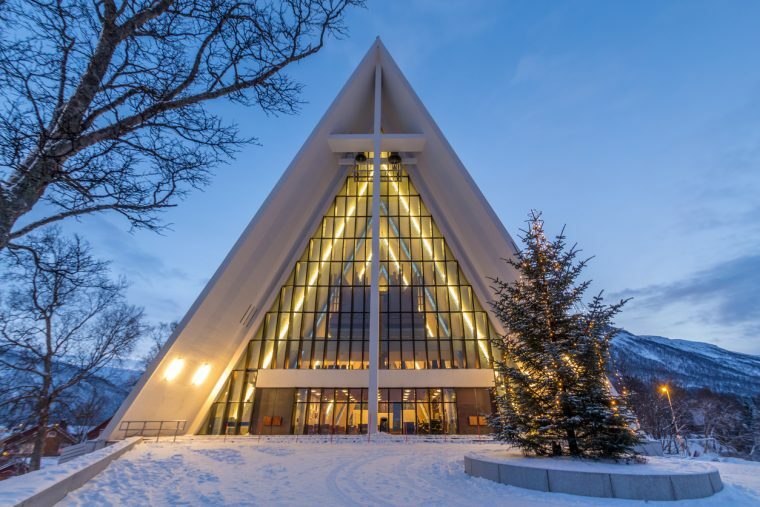 Toy with vertigo at Pulpit Rock and train your eyes on the dark waters around Tromsø, waiting with bated breath for the steely grey skin of a humpback whale to break the surface. 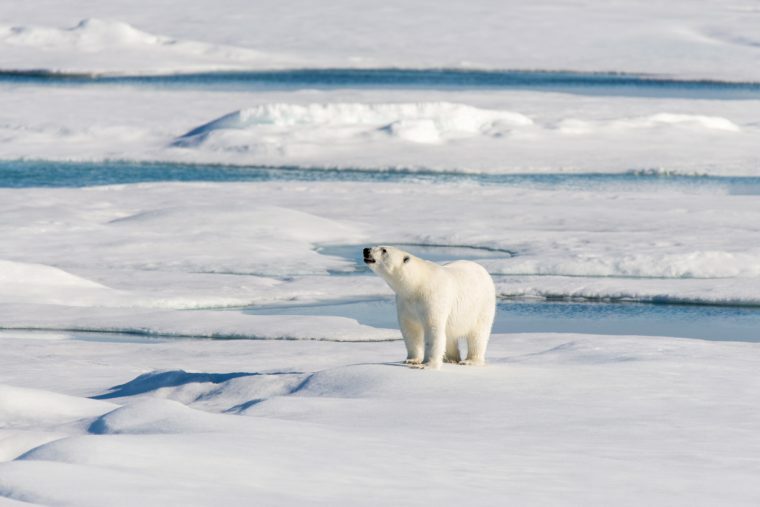 Follow the coastline further north into the Arctic Circle and you’ll find yourself in polar bear territory. Look up and you might just find yourself beneath the metre-wide wings of a white-tailed eagle. Catch the spray of the Seven Sisters Waterfall in your hair and watch the goose bumps form as the chill of the Jostedalsbreen ice cap hits your skin. The largest glacier in mainland Europe won’t be here forever; its icy blue mass is not-so-slowly shrinking, so see it while you still can. If you’re there at just the right time, you might even hear the guttural roar of its ice calving. 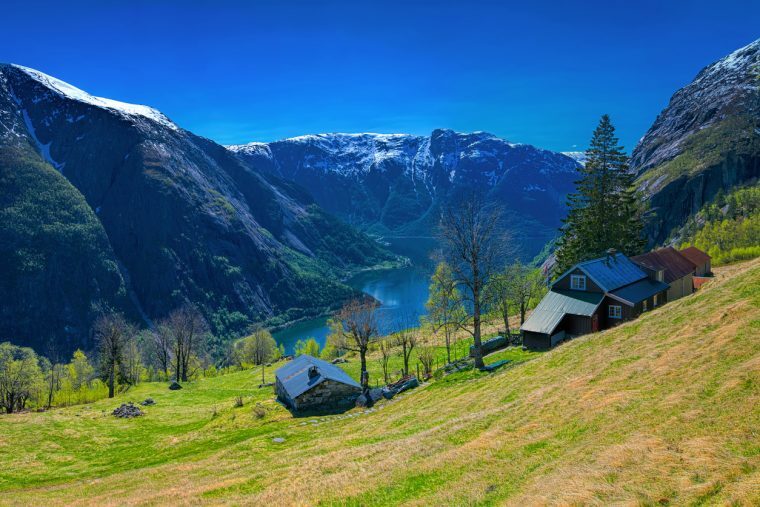 Those fortunate enough to call the vast valleys nestled amidst the fjords home have created villages, towns and cities as intriguing as the region’s natural wonders. Bergen is the starting point for many fjords cruises, busier than you expect, with Bryggen’s timber reminders of the gentlemanly Hanseatic League sandwiched between high-end shops and a raucous fish market. 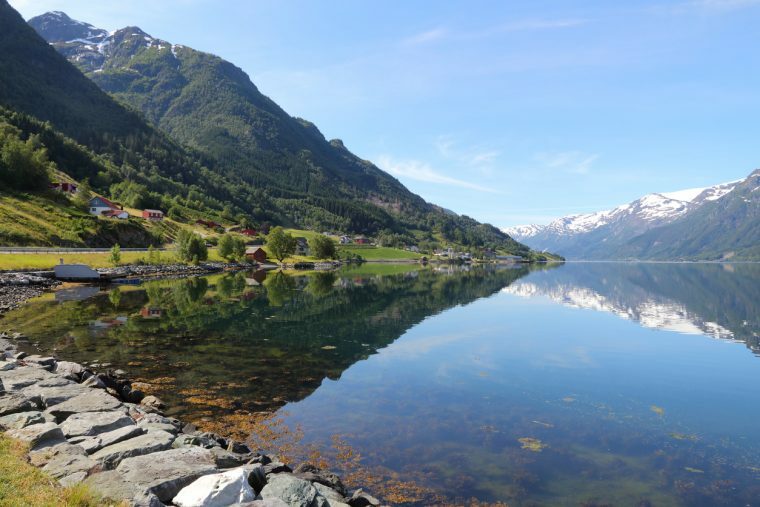 The fjord village of Olden takes its role as the gateway to the beautiful Nordfjord seriously, encouraging its visitors to get out and about on the glacier-fed waters of Oldevatnet Lake or hosting them in Jostedalsbreen National Park. Heading further north, as far as you can go whilst staying on European soil, reindeer graze all year round in the North Cape, herded by the indigenous Sami people. Where you go and what you see depends on who you cruise with. Scenery and sophistication come together for the luxury lover and full-blown expeditions into the Arctic wilderness spark a flame with explorers. Back to nature bank holidays are a blessing for the time-strapped and burned out, and the fjords for families sees kids go wild in the great outdoors. Decide which category you fall under and read on for our recommendations. Much has been made of the digital detox, a time to disconnect from the Wi-Fi, put down your mobile and close the laptop. The truth of the matter is that the Norwegians have known the importance of switching off for years. There is an inherent appreciation of the great outdoors here, with time spent reconnecting with nature considered a basic human need. Norway is such a vast country that less than 25% of Norwegians live in rural areas, but the close proximity of the cities to the surrounding fjords and woodlands makes getting out and lapping up all that fresh air a breeze. In this part of the world, an after-work stroll out of the city can see you in the wilderness in less than an hour. 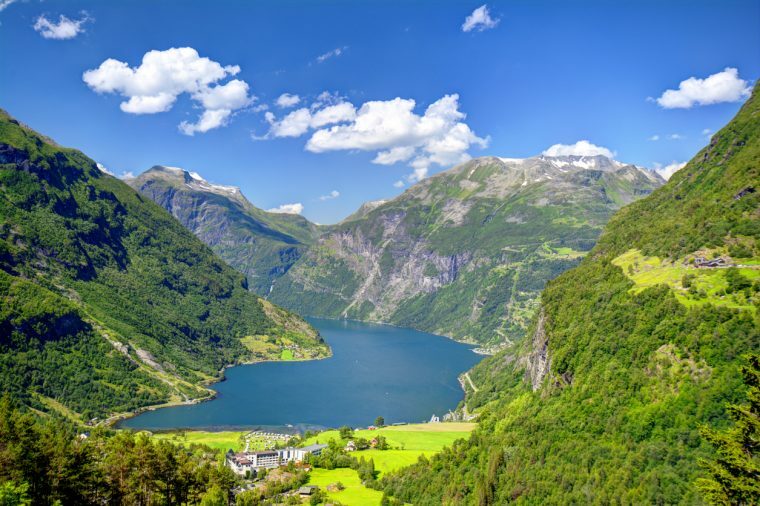 Planned to coincide with the 2018 bank holidays, Fred Olsen’s ‘Five Night Fjords’ itineraries are heaven sent if you’re on the brink of burnout but don’t have the same access to the wilds. Departing late on Thursdays, sailing from the northern UK ports of Newcastle or Edinburgh means that within a day of leaving the UK, a leisurely day of eating, drinking and being merry no less, you’ll find yourself in Fjordland. Despite the shorter than usual itinerary, you’ll spend plenty of time in port. The five-night foray into the fjords sees you negotiate the sweeping curves of the Lysefjord, spend a full day in Bergen and visit Eidfjord. 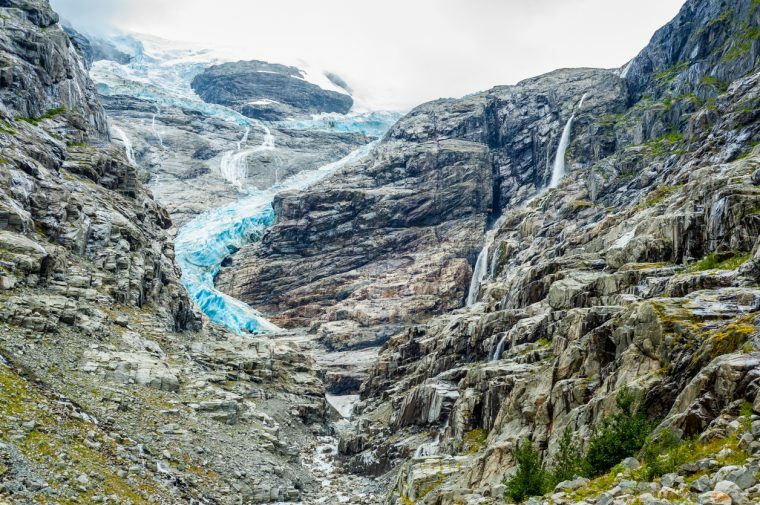 Here you’ll have the opportunity to kayak along the dramatic Hardangerfjord – Norway’s second longest fjord – and tour the towering Vøringfoss Waterfall. 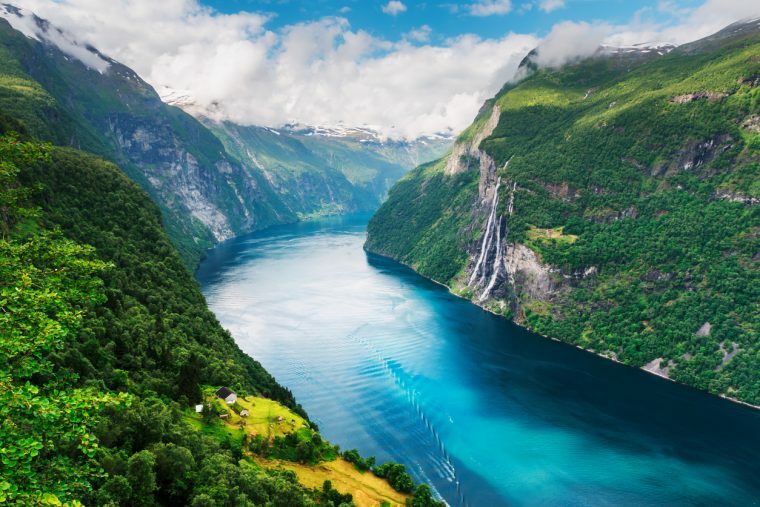 After sailing deep into the Hardangerfjord, eyes wide at a wild landscape that wouldn’t look out of place in Disney’s Frozen, you’ll divert into Maurangerfjord, where catching sight of the Furebergfossen Waterfall is the perfect end to an amazing bank holiday break. Come Tuesday morning, you’ll wake back in British waters feeling rejuvenated and as if the whole weekend was little more than a dream. It sure beats a weekend of DIY, doesn’t it? There’s an adventurer in all of us and Hurtigruten’s expedition ships will indulge your inner explorer. Hurtigruten’s fleet are less cruise ship, more base camp. The vessels have plied these waters since 1893 and the crew are locals. 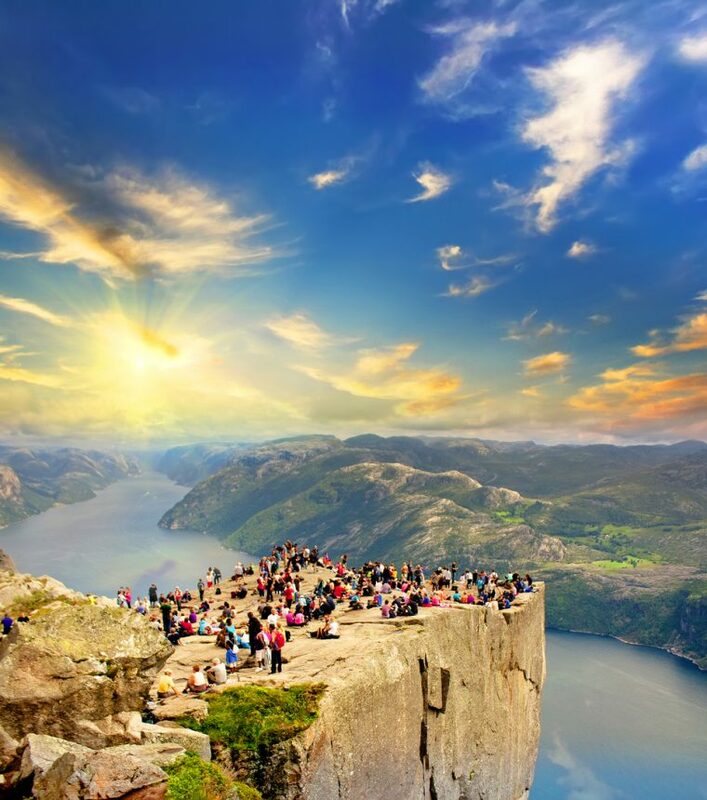 Norway is in their DNA and they take great pride in sharing their world with you. When it comes to sailing the Norwegian Fjords, Hurtigruten was here first and they have cruised the Norwegian coast between Bergen and Kirkenes for decades. Described by Lonely Planet as ‘The World’s Most Beautiful Voyage’, the cruise line’s ‘Classic Round Voyage’ calls at 34 ports of call over its 12-day duration. Hurtigruten isn’t the operator for those who prefer to sit inside and watch the scenery pass by the window. Instead, they encourage you to follow in the footsteps of explorers and have experiences that remind you of just how incredible our world is. You’ll find no butlers on board, rather Antarctic expeditioners and a world-leading glaciologist. Nobody will bring hors d’oeuvres to your stateroom every evening but that doesn’t mean the food isn’t incredible. The Norwegian coastline is nature’s own larder and Hurtigruten’s chefs incorporate local, fresh produce and long-held Norwegian traditions into every mealtime. The cod at lunch was caught that morning and the basil in the pesto at dinner was handpicked by supplier Judith in her Kabelvåg herb garden. You can taste the freshness and it provides the perfect sustenance after a day following in the footsteps of the great Arctic explorers. Hurtigruten’s ‘Expedition across the Arctic Sea’ itinerary takes you beyond the Norwegian Fjords into the Arctic wilderness. Remote, mysterious and extreme, Svalbard is the polar opposite of your traditional cruise port. 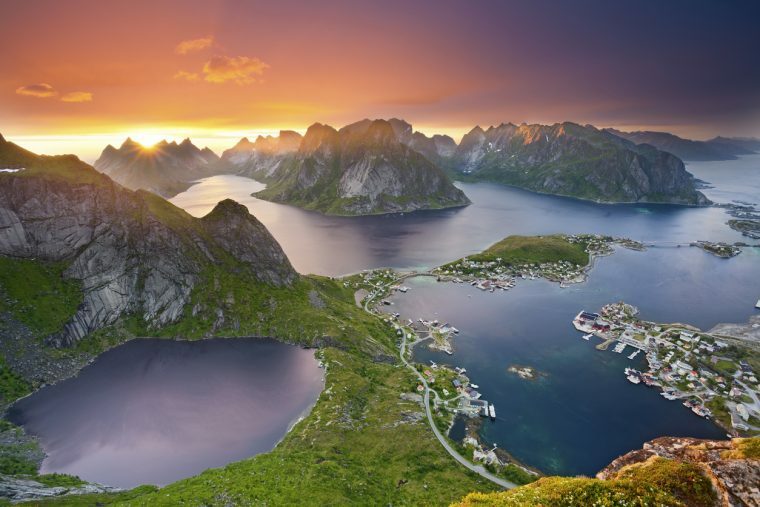 Sailing through the silent Lofoten Islands, entering the realm of the polar bears in Bjørnøya (Bear Island) and standing below the steel globe that marks the northernmost point of the European mainland are stirring experiences for even the most hardened traveller. Even before you reach such remote locations, you’ll see a completely different side to the Norwegian Fjords as your expedition ship goes off the beaten track in search of slender, silent fjords that are beyond reach for most. Computers. They’re glued to them. If it isn’t the Xbox or PlayStation, it’s selfies galore on Snapchat or Minecraft on the MacBook. It’s time to go back to basics and answer the call of the wild. More kids than ever are holing themselves up in their rooms, glued to the TV and addicted to technology, their hands never dirtied and their eyes never opened to how amazing the world is in real life. Even the coolest kid couldn’t fail to be amazed by the Norwegian Fjords. The scenery is pretty awesome, even for a hard to please adolescent, and the excursions here are anything but boring. Inside the most IT-addicted teen is an adventurer just waiting to get out and a family fjords cruise will unleash their inner adrenaline junkie. We’re talking kayaking along the deep dark waters of the Geirangerfjord, peering over the edge of vertiginous Pulpit Rock and testing teenage taste buds with local specialities like reindeer steak and King Crab. When you aren’t out and about on adventures in port, you’ll spend your sea days on one of the best family ships ever to sail from the UK. 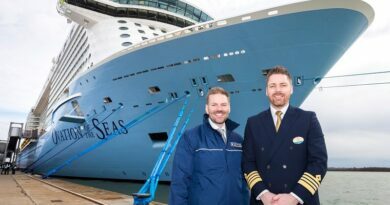 Independence of the Seas is set to be better than ever in 2018 too, with a multi-million-pound makeover bringing a host of ‘first at sea’ features to an already amazing ship. Waterslides, an all-new Escape Room, Laser Tag and the first ever trampoline park at sea join the existing rock climbing wall and FlowRider surf simulator to guarantee the word boredom is banished from the kids’ vocabulary. A Royal Caribbean cruise to the Norwegian Fjords is also an unbeatable choice for multi-generational holidays. There are few other destinations in the world that appeal so well to such a wide range of ages and even fewer cruise lines that fit the brief. 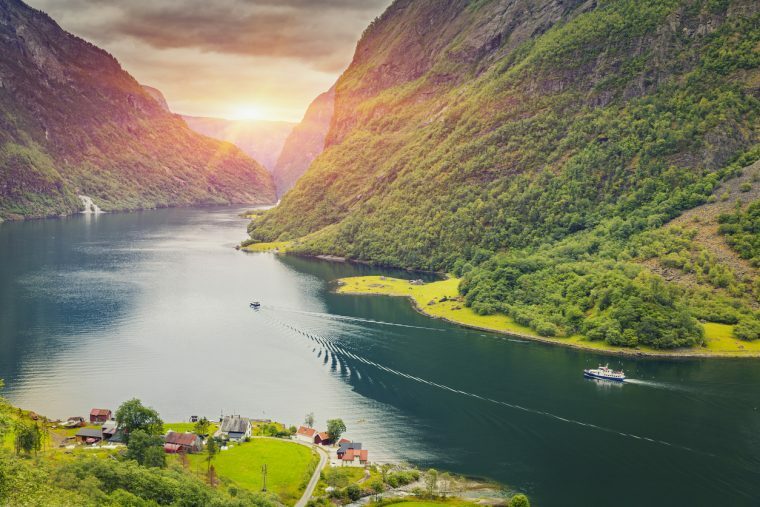 Royal Caribbean’s Fjord itineraries are a real family affair and the lack of airport hassle makes sailing from and to Southampton all the more enticing for anyone with little travellers or elderly grandparents in tow. Modern luxury means seeing the world without sacrificing your creature comforts, a concept in which Azamara Club Cruises excel. 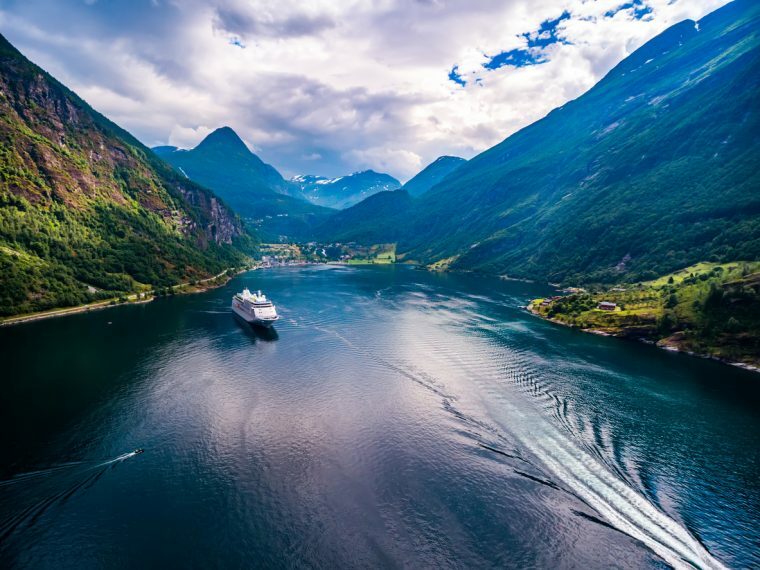 The beauty of six-star cruising is that the smaller ships of ultra-luxury cruise lines like Azamara can ease gracefully into lesser known fjords and villages, their itineraries retaining an air of exclusivity. 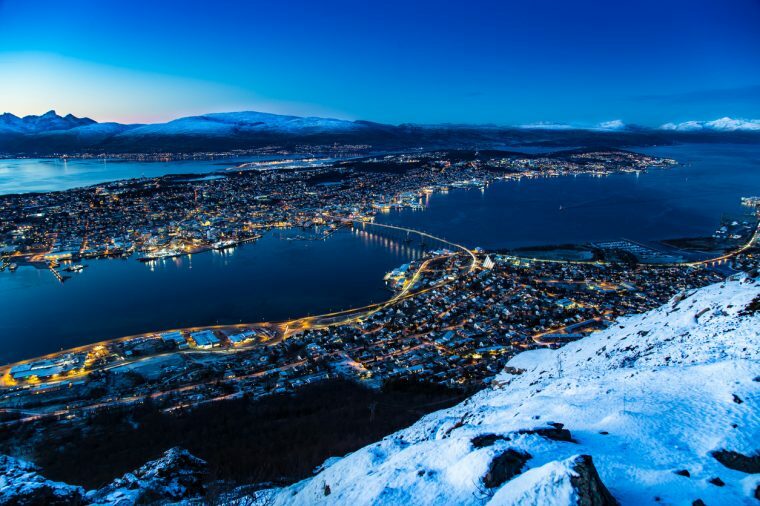 Azamara’s ‘Destination Immersion’ concept comes into its own in vast and varied Norway too, your ship staying late into the evening in Tromsø, Molde, Olden and Bergen as part of the 16-night ‘Norway and Midnight Sun Voyage’ for example. The itinerary also features one of the cruise line’s famous ‘AzAmazing Evenings’. Whilst specific details are yet to be confirmed, previous events have included a private Norwegian recital at Bergen’s Grieg Hall. Guests will also enjoy an overnight stay in the beautiful art nouveau town of Ålesund. Luxury cruising means longer stays, with no rushing around and never leaving a place feeling like you have only seen half of what it has to offer. Modern luxury is all about taking things at your own leisurely pace, something which is the ultimate indulgence in our increasingly busy lives and which Azamara Club Cruises do exceptionally well. Azamara Journey carries just 690 guests, with an attentive crew of 408 taking care of your every whim and want. If the thought of an all-out expedition leaves you cold, Azamara’s private club ambience will appeal. A near-complete redesign of the ship in 2016 saw the introduction of open air dining and live music venue, The Patio, an area that has never looked better than it does with a spectacular fjords backdrop. No expense is spared and no detail is overlooked on Azamara’s quest to bring uncompromising luxury to the Norwegian Fjords. If the truth be told, there really is no better way to relax after hiking the Briksdal Glacier than with a chateaubriand for two in Prime C, followed by a serene night’s sleep on an outdoor bed beneath the stars.